Your Google+ icon is showing your age. Google Plus was laid to rest in October 2018, yet your website still has a G+ icon haunting every page on your website. There’s no room for sentiment. It’s time to get rid of that ghost once and for all. Rather than removing the G+ icon and link altogether, we recommend replacing it with a Google My Business icon and link to your Google My Business page. This helps reinforce a connection between your website and your Google My Business property. It’s also a natural swap, as Google My Business starts taking on some social features – posts, reviews, ratings. We like to think of Google My Business as a phone book on steroids. Remember the days of picking up a phone book to find out the phone number or address of a business? Unless you’re an ironically-retro hipster or above the age of 85, you probably don’t use a phone book in your daily life anymore. While the days of phone books are long gone, Google My Business has taken the phone book into the digital age and is completely reshaping the way customers find information about businesses. Let’s say you search for “digital ad agency near me” using Google. In the search results, you’ll see a stack of listings that look like the one below. The more information a listing has, the higher it will appear in the list of digital ad agencies nearest you. Across a range of industries, “near me” or location-based search is on the rise. And with the advent of Google My Business, planning a last-minute pizza dinner for the family or finding your credit union’s nearest branch has never been easier. As users search for the nearest instance of your industry, your Google My Business profile will put you on their map – but Google My Business isn’t just for wayfinding anymore. A Google My Business listing displays way finding information such as your company’s name, address, hours, phone number, and helpful links to your website and directions. But, a listing on Google My Business also rolls in some social features you may have seen on other platforms such as Facebook, TripAdvisor, and the like. 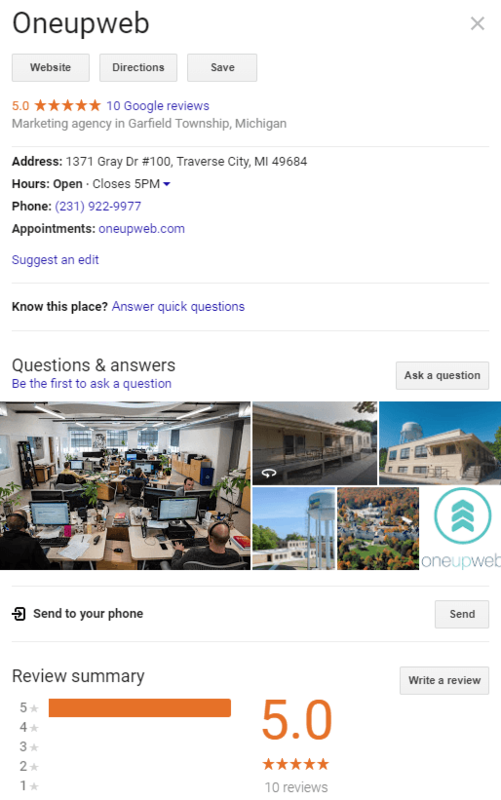 Google My Business now offers expanded features such as reviews, photos (both photos that you post and photos that visitors post), posts, a new messaging feature, and more. Plus, new features are being added all the time as Google My Business continues to adapt to display information the user wants to see most. With its goldmine of untapped digital marketing potential, using your Google My Business listing to display basic information like your phone number and address is about as dated as using a phone book these days. Expanding your profile to include more enticing photos, promotional offers, and helpful communication can help your business to connect with your target audience and be found in more ways than ever before. When was the last time you audited your Google My Business account for NAP consistency? Do you have a customer review strategy in place? Or maybe you just need help swapping out your Google Plus icon? As local search experts, we can help you take full advantage of Google My Business. It really is one of the easiest wins any local business can achieve with a solid strategy and little legwork. Let’s talk about your GMB strategy.